Cancun is a Mexican city situated in the south-eastern part of the country. It is a very famous tourist destination and is a relatively new coastal resort. It is a part of the Yucatan peninsula and was created in an attempt to replicate the success of Acapulco. It has got stunning white sandy beaches and Caribbean coastline. Tourists flock to this beautiful coastal city and use mainly car rental to get around. The city is divided into two areas, Ciudad Cancun and the connected island area of the Hotel Zone. Downtown Cancun is of relatively less interest to tourists. The main attractions are in the Hotel Zone. The four lane boulevard Kukulcan joins these two areas. Water sports are the main activities of Cancun. Fishing is also very popular among tourists. There are a number of diving schools in and around this city. Sailing, windsurfing, kayaking and parasailing are other popular water sports. Dolphin Discovery is a very popular attraction. It is located just outside of Cancun, on the Isla Mujeres. It lies in the very heart of the island. People come here to swim with the dolphins and learn more about these highly intelligent creatures. Some people just come to observe the dolphins. Yachting and cruising is another hit amongst the tourists. Various cruises are available around the Cancun coastline which offers a spectacular view of the city. The interactive Aquarium Cancun is also a must-see. There are large aquariums with colourful fish and landscaped reefs. Tourists can swim with the dolphins or feed the sharks when they are here. There is a bird sanctuary as well and this is perfect for those who love nature. Tourists flock to these places and prefer car hire for its convenience. The Maya Ventura is another favourite of the tourists. It features an enormous labyrinth where visitors face a range of challenges and obstacles while they go around looking for hidden treasures. It hosts cultural events as well. 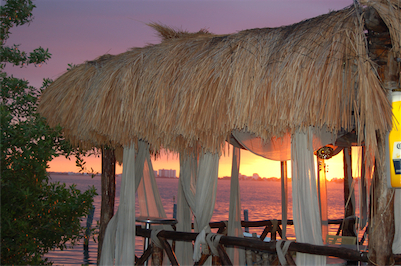 Puerto Morales is located around 19 miles south of Cancun and is a well-known fishing village. It is not as crowded but has a breathtaking stretch of reef. Cancun car hire is ideal if you want to head out to either of these places. Cozumel is also a favoured destination of scuba divers. It has got more than 100 dive sites as well as a museum. Isla Mujeres is popular amongst the backpackers and is just seven miles from the coastline. Tourists come here for sunbathing, to see the Mayan temple ruins, and visit sea food restaurants and handicraft stores. The ideal way to see this stunning coastal city is by making use of car rental so you can travel in style. Rentalcargroup.com is one of the largest independent car rental online brokers; we compare prices for car rentals from more than 35,000 locations. Cancun Airport There are many car rental agents offering different categories of cars from Compact or Economy to SUV's; we can offer you a wide range of rental cars. So leave us looking for you and just select the car that suits you the most. It is very simple. Cancun Airport is a popular rent a car destination, there are many car rental companies in Cancun Airport with a wide range of different car categories. Many of our clients have rented a car in Cancun Airport and had good experiences. Do not wait with booking your car for Cancun Airport before you know prices will go up and the availability will get low. Last month, the average car rental length at Cancun Airport was 8 days. The average rental car length at Cancun Airport is 7 days. The most booked rental car type currently at Cancun Airport is COMPACT cars. Last year, the most booked rental car type at Cancun Airport were COMPACT cars. How much does it cost to rent a car at Cancun Airport? Last month, the average car rental price was 70 USD. Last year, how much did it cost to rent a car at Cancun Airport? Last year, the average car rental price was 144 USD. What is the current average daily price to rent a at Cancun Airport? Last month, the average rental price was 9 USD per day. How much did it cost to rent a car at Cancun Airport over the past 12 months? Last Year, the average rental price was 20 USD per day. The car rental companies available at Cancun Airport are: Alamo, National, Enterprise, Thrifty, Dollar. See below last 5 customer reviews. Our customers rated Cancun Car Rental with an average of 10.00 based on 1 ratings.